Do You Double the Time When Baking Two Things at Once? The middle rack is hospitable to most dishes. 1 Do You Double the Time When Baking Two Things at Once? 4 What Is a Baking Wire Rack? In many ways, learning how to use a kitchen appliance is like learning how to drive a car: It helps to know what functions the components perform so you can employ them to best advantage. This tenet holds especially true of an oven, and not just the temperature controls but the interior racks, too. Once you understand why ovens are built with upper, lower and middle racks, you can confidently bake on two racks at once – and change “lanes” when you want to as well. Place casseroles, meats and other dishes that you want to emerge with a browned top on the upper rack of the oven. This is usually the hottest region of an oven. Put pizza, focaccia, flatbreads, pie crusts and other items that you want to brown well on the bottom – with a crispy crust – on the lower rack of your oven. Use the middle rack as the proverbial middle ground – a good place for most dishes or if you’re uncertain about the two other racks. Assume that a recipe calls for a dish to be cooked on the middle rack unless it states otherwise. You really can’t go wrong baking a dish on the middle rack, where hot air circulates evenly around food, producing neither a browned top nor a browned bottom. Ensure that you have one rack firmly in the lower slot of your oven and one in the middle slot when you wish to cook two different dishes at the same temperature. This means that – at least for now – you’re leaving the top rack free and clear. Put one dish on the lower rack and the other on the middle rack. Stagger the dishes so they aren't directly on top of each other; push one dish to the left side of the oven and the other dish to the right so heat can freely circulate. As you do so, leave at least 1 inch of space between the end of the cooking vessel and the oven wall. If you’re baking two cakes, be sure to leave enough room for the batter to inflate during the latter half of the cooking time. Set a timer for the halfway mark of the recommended cooking time. Switch the rack positions of the dishes when the timer goes off. Additionally, rotate the dishes 180 degrees from their original positions to help them cook evenly. For cakes, make these two adjustments three-quarters of the way through the recommended cooking time so the activity doesn’t cause the batter to collapse. Peek inside the oven when you’re using two racks at once. This is partly why ovens have clear, glass doors – so that you can check on the food you’re cooking. If a dish you have on the upper rack is developing a deep brown topping, shift it to the bottom rack. Likewise, slow down a fast-cooking dish situated on the lower rack to the middle or upper rack. 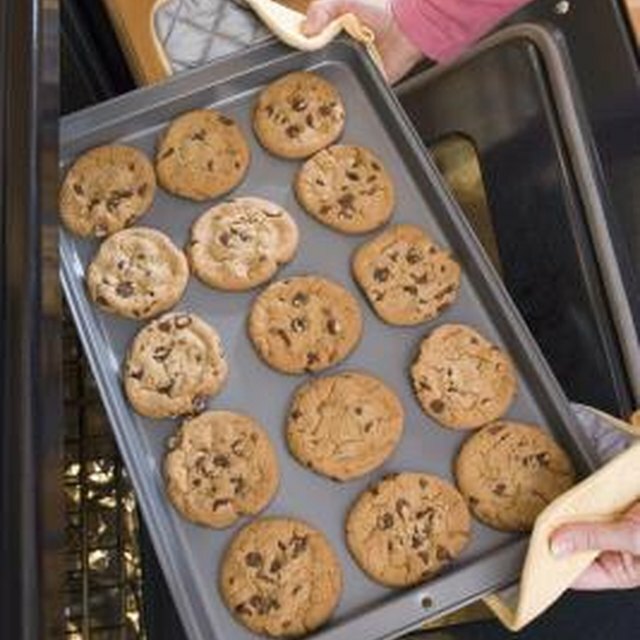 Experiment with baking cookies on two racks at once. Some cooking experts say it’s OK to shuffle sheets of cookies around an oven as they bake. Others are adamant that only one sheet of cookies should be baked at a time, and on the middle rack, for the best quality. Ovens vary and results may vary. Preheat your oven fully to make the most of baking on two racks at once. Proper preheating can take as long as 20 minutes on some ovens. Use oven mitts to reposition dishes in the oven. Real Simple: When Should I Use My Oven’s Upper, Middle, or Lower Rack? Reluctant Gourmet: Is Oven Rack Position Important? Can You Grease a Pan With Canola Oil?